An instructional video on homesteading. Journey with this city gone country family as they share some basic homesteading skills that anyone can master. In this video you will learn such skills as raised bed gardening, milking the family cow, making butter, cheese, kefir, bread, and processing chickens. Highly educational and entertaining for the entire family. HOMESTEADING FOR BEGINNERS is just the video for those who are considering the possibility of moving to the country. This video gives a delightful overview of life on a small family farm. 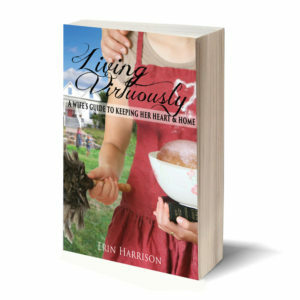 Erin and Mark Harrison invite the viewer into their home to learn and laugh with them and their five children through the many adventures of homesteading. You gain insight into all that it takes to get a REAL chicken dinner onto the table from the ground up – literally, from seed to supper. All of the scenes are filled with a beautiful rural setting and happy, healthy, helpful children keep popping up into almost every scene. Learn how to make butter and cheese using kitchen tools you likely already have on hand. See how this family raises and harvests chickens and eggs. Get an introductory demonstration on wood splitting, building a simple chick pen, learn how to start seeds and tend a low-maintenance garden. Mama takes the time to show you how to freeze and can your produce and meat, gives you the recipes, and then shows you how to prepare the meal. Pamper your inner flower-child and learn how to make a wild-flower crown to adorn your head. If you watch carefully, you might spot Mike and Gabriel Pearl giving a knife-throwing demonstration. 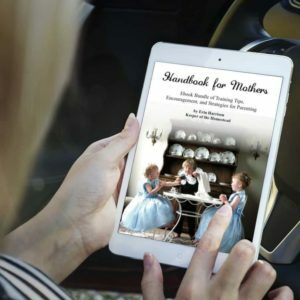 The attentive viewer may even pick up some tips on how to incorporate child training and education throughout the busy day. Washing eggs becomes a math and chemistry lesson taught by a curly blond-headed little girl that needs a step-stool to reach her mama’s kitchen sink. It’s one of my favorite scenes in the film. A take-charge big brother is happy to demonstrate how to use scraps of wood to make signs for the garden. Listen carefully as Papa patiently explains how to milk a cow while little voices comment on the condition of the barn floor (you’ll have to rewind here as your laughter might drown him out). Grandpa and Granny loved watching with us as little ones stole scene after scene. Grandpa said, “I can see now, if I wanted to homestead, I’d have to find some little helpers.” HOMESTEADING FOR BEGINNERS should come with a warning label for parents that are used to children sitting peacefully in front of the television all day. After viewing this video, those children could be inspired to go enjoy the great outdoors more often. They might begin asking for some chickens or a cow of their own . . . possibly even some pigs to ride! 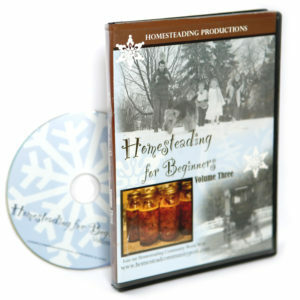 “I have already watched the first two ‘Homesteading for Beginners’ DVDs – and really enjoyed them. Your children are enchanting, and watching them pitch in and have fun with all the activities brought back fond memories of my own childhood and long, hot summers and deep, cold winters spent on my Grandfather’s farm. I’m so glad you invested the time and effort to make these inspiring productions – and I do look forward to seeing whatever you do next! With thanks and my very best regards, -Mark H. R.